NEW ORLEANS, LA - 1 Sep, 2017 - To commemorate the 73rd anniversary of Victory over Japan Day (JV Day), September 2, 1945, the non-profit organization State Funeral for World War II Veterans, launches a nationwide petition drive to convince the President of the United States to designate a state funeral for the last Medal of Honor from World War II. 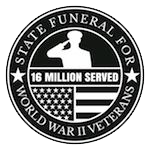 This single state funeral would provide special recognition, and serve as a final salute to all 16 million men and women who served in the United States armed forces between 1941 and 1945. In total, 464 Medals of Honor were awarded to servicemen in World War II. Only four of these recipients are living today. Designating a state funeral in Washington, D.C., for the final living Medal of Honor recipient is a fitting to honor the Greatest Generation. Citizens can go to www.worldwar2salute.org to sign the petition, which requests that President Donald Trump designated this single state funeral. Under American law, the President of the United States has the sole authority to designate a state funeral and he may do so for any deserving citizen of his choosing. Historically, presidents have designated these funerals for generals and other extraordinary Americans. In 1921, President Warren Harding designated a state funeral for the Unknown Soldier from World War I. President Harry Truman designated a state funeral in 1948 for General John Pershing. President John F. Kennedy signed the papers to allow a State funeral for General Douglas MacArthur and President Lyndon extended this directive. In the 13 years that have passed since the state funeral of the 40th President of the United States, Ronald Wilson Reagan, much has changed. The nation is divided in many ways and yearns for a non-political event to bring us together as one – to celebrate the sacrifice and accomplishments of our Greatest Generation. General Douglas MacArthur, Supreme Allied Commander of the Pacific, and General Dwight Eisenhower, Supreme Allied Commander of Europe, were each duly honored by the nation with state funerals. The selfless, brave men and women who served under them deserve the honor of special recognition at a state funeral for the final Medal of Honor holder from World War II. State Funeral for World War II Veterans exists to convince the President of the United States to designate a state funeral for the last Medal of Honor holder from World War II, as a final salute to the 16 million men and women of the greatest generation who served in our armed forces from 1941 to 1945. For more information on how to join us in this mission please visit www.worldwar2salute.org.